As one of the oldest towns located near the West Coast in Florida, Dunedin is known for its peaceful, easygoing atmosphere as well as their beautiful beaches. Dunedin Florida has a little something to offer everyone! Whether you head off to lay on the white sands of their beaches, go for a swim in the clear waters of the ocean or take a walk downtown to do some shopping, people of all ages will be happy here! Besides visiting their lovely beaches you can find other outdoor activities to take part in. You can head downtown and rent a pair of skates or a bicycle and go for a ride on their award winning trail. Golfers will love the chance to play at the Dunedin Country Club where you can play on their famed course. Dunedin also has several other courses for golfers no matter if you are a seasoned golfer or just starting out. 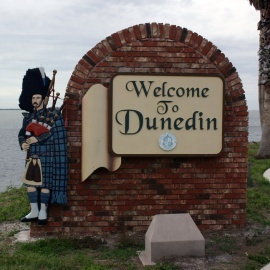 Dunedin also offers its visitors great shopping at one any of their charming stores they feature in their downtown. Depending upon what time of year you come to Dunedin you will also find it to be home to different types of festivals and special events. After a busy day in Dunedin you can head out to one of their many restaurants where you can dine on anything from pizza to seafood. Dunedin features many restaurants that will suite anyone's taste. Whether you are looking for a quiet intimate dining experience or a fun family dining experience, there is a restaurant just right for you. So if you are looking for the peace and quiet of relaxing on the beach watching one of Florida's famous sunsets, or golfing in the sunshine on a world class course, you will find that Dunedin is the place to see while you are in Florida. Sea Sea Riders has been a local Dunedin business for 30 years.